How do you feel after work, or at the end of a long work? It’s an important question to ask yourself because the workplace is one of the biggest sources of stress in your life. In fact, workplace stress causes issues for 73% of workers. Now, some employers are great at helping employees manage this issue. For example, Madalyn Parker an employee of Olark, a tech company had run into some personal issues. This had led to some mental health issues that became so severe that she felt that she needed to take time off. She left an out-of-office email to let everybody know that she was taking time off. More importantly, she told them why. Then, Olark’s CEO emailed her and received the out-of-office response. For most people, that would be a terrible thing. Mental health still has a stigma attached to it and a lot of people don’t see it as a justifiable reason to take time off. 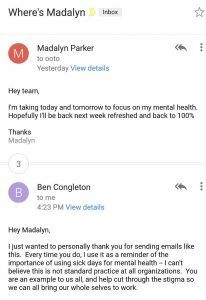 With just one message, Olark CEO Ben Congleton recognises why it’s important to take care of your mental health. While Olark may understand the effects that mental health can have, most companies don’t. In fact, many of you reading this would expect an entirely different response to that email. You might even be told to ‘not bother coming back’. Thankfully, you have plenty of choices to get more control of your life, your time and your wellbeing….and even potentially escaping the 9-5 pressure cooker for good, if that’s what you want. One of them is replacing your current job income, with income from a passive source. That’s what this investor is doing. In the past 11 months, she reports creating around $60,000 of net passive income from a commercial real estate. That’s money in her pocket after mortgage repayments and expenses. If you want to find out how she does it, join her mentor Helen Tarrant at her upcoming seminar. The event in Brisbane is tonight, so if you are in Brisbane hustle on over here and grab your seat if there are any still remaining.